Just as every home and every person is different so are your stairlift requirements. At Beechfield Stairlifts our experts will help to choose the correct lift for you. The design of your staircase will determine what type of stairlift you need. They fall into two broad categories – If your staircase is straight and does not have any corners or bends a straight stairlift will suit your needs. Curved stairlifts have tracks that are specifically designed to suit staircases that turn corners, go across intermediate landings and even up spiral staircases. They are custom made for your staircase so you are guaranteed a perfect fit. Always make sure that your stairs are measured by a qualified stairlift surveyor. This will ensure that the stairlift is customised for your stairs and your needs. Beechfield Stairlifts use specialist software to accurately measure your stairs and produce an interactive 3D model of your new stairlift in situ in your home. From this you will get an accurate picture of how the stairlift will look in your home. There are a range of rails and tracks that suit different types of stairs. Eg if you have a narrow staircase we would recommend a stairlift with a very narrow track and a narrow seat. If you have a door near the bottom of the stairs a slide track that retracts when the stairlift is not in use would be most suitable. Whatever your requirements, our stairlift surveyors will accurately measure your stairs and recommend the best solution for you. 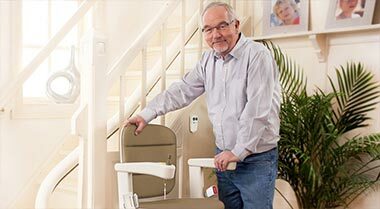 Powered options make it easier to operate your stairlift by automatically turning the seat when the stairlift reaches the top of the stairs. A powered footplate automatically folds up the foot plate when the stairlift is not in use and removes the need to bend down. Depending on your own level of mobility and dexterity powered options may offer the best solution. Grants are available from your local council under a Mobility Aids Grant Scheme. This can cover up to 100% of the cost. For more information contact your local council or ask our Stairlift Specialists for assistance. It is possible to reclaim VAT if you pay for all or part of your new stairlift. This can be reclaimed immediately once your stairlift is installed. For more information on Stairlifts please contact us on 1890 989 353.